Alzarri Joseph, who took a record 6 for 12 on his debut was hammered for 53 off three overs, primarily due to 28 runs conceded in the 13th over that changed the game. 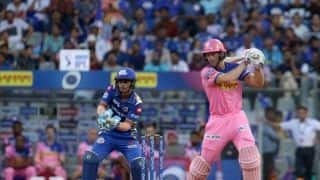 Mumbai Indians’ (MI) wicketkeeper-batsman Ishan Kishan defended teammate Alzarri Joseph‘s indifferent performance against Rajasthan Royals (RR) after his brilliant Indian Premier League (IPL) 2019 debut against Sunrisers Hyderabad, calling it a part and parcel of the game. “It’s part of game. 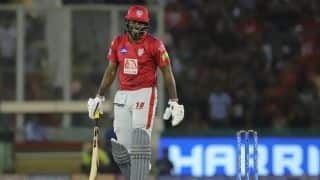 The other day he took six wickets and helped defend a small total,” said Kishan after MI went down by four wickets as RR chased down their total of 187 for five with four balls to spare. “It was an important over as Rajasthan went ahead then. But still he’s a very good bowler and will make a strong come back,” predicted Kishan in support of the young pacer. “I don’t know about his injury status as he was on the physio’s table,” he said. Kishan also praised Buttler’s blistering innings of 89 in 43 balls laced with seven sixes and eight fours.